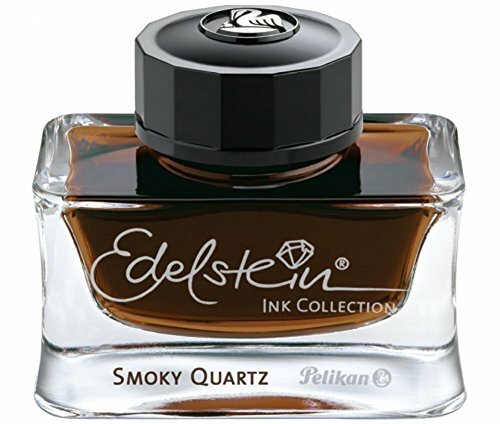 Smoky Quartz is the Pelican Edelstein color of the year for 2017. It's a deep brown, not quite chocolate color. I can't tell you about the bottle, since I based this review off a sample. I got this sample from gouletpens.com. Their samples are only 2ml, and I wish I had more ink to play with for a full review. I think this would be a great brown for fall (I love to coordinate my inks with the current season). There is no sheen or shimmer. This shows Smoky Quartz on Rhodia paper. I had a lot of hard starts and skipping with the stub nibs. There was some ghosting but no bleed through. The swab on the bottom shows a decent amount of shading, but that didn't transfer into the writing. The flex writing didn't show any shading. There was a lot more shading visible on this Nanami Paper Crossfield, which uses Tomoe River paper. None of the ink bled through (although it came close on the swatch at the bottom), but there was a lot of ghosting. The Leuchtturm paper showed a little shading, more than the Rhodia but less than the Crossfield. No bleeding, some ghosting, and no feathering. Smoky Quartz is a little darker than Pilot Iroshizuku Yama-Guri, and a little deeper in color than Caroube de Chypre (and doesn't have the sheen and shimmer). This quote was done on a Dingbats notebook with a Noodler's Ahab, and there was no bleeding or ghosting. There is a little bit of feathering. On this paper the ink looks a little flat. It lost some of its vibrancy and didn't show much shading. Overall, I was disappointed in the amount of shading this ink had. It's an average ink, but I'm not going to be rushing out to buy a bottle anytime soon. Below is an affiliate link for the ink on Amazon.